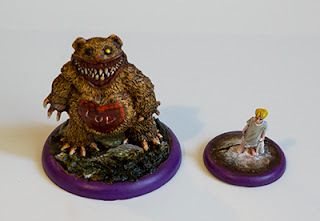 The Dreamer is one of the most wonderfully sick creations of the Malifaux people. Belonging to the Neverborn faction (the horrors/monsters) he is a boy whose dreams shape reality. 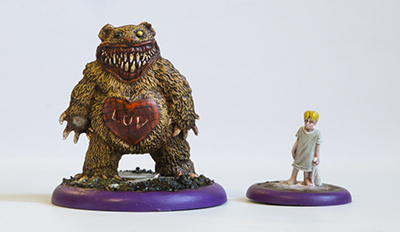 Whenever he dreams somewhere far away on Earth his dreams become real in the city of Malifaux. Convinced none of this is real he walks the streets of the weird city "playing" with other people. Playing in as cruel ways as only a child can devise. 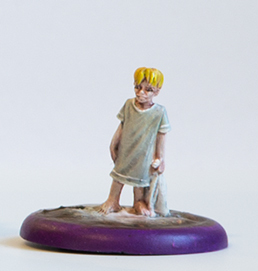 I've now started painting his crew. Here are the first two models - The Dreamer and Teddy Bear.